Frierson, L.S. 1928. Illustrations of Uniondae. Nautilus 41(4): 138-139. 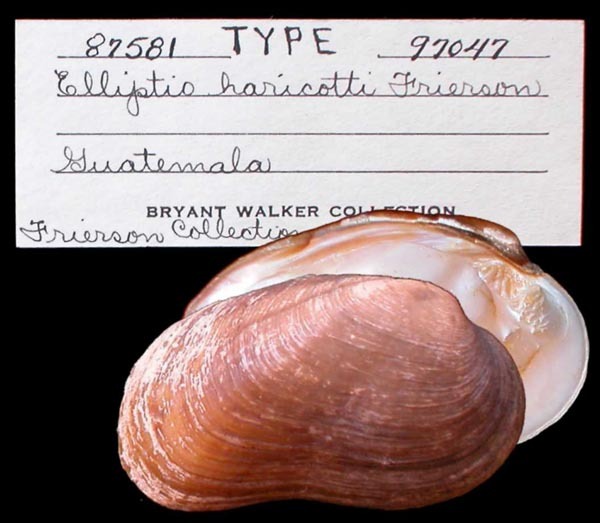 Elliptio (Nephritica) haricotti Frierson, 1927. Frierson, 1928, Nautilus: 139, pl. 3, fig. 4. 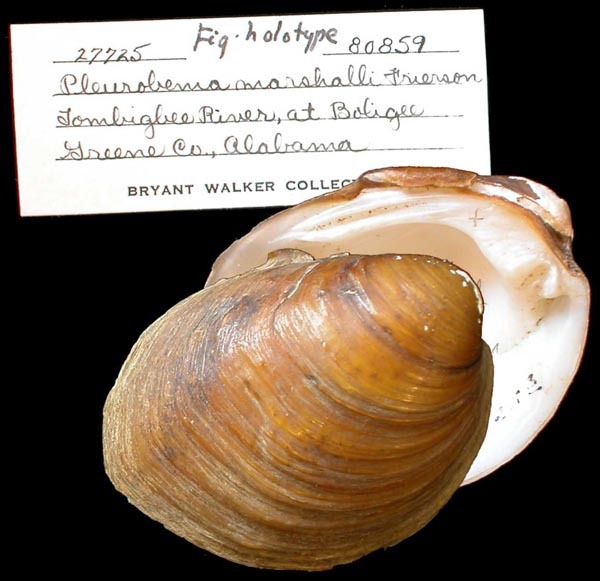 Elliptio (Nephronaias) sajensis Frierson, 1927. Frierson, 1927, Check List N. Amer. Naiades: 37, sp. 139. Frierson, 1928, Nautilus: 139, pl. 2, fig. 2. Type(s): SYNTYPE UMMZ_108010, Rio Saja, 5 mi W Esmeralda, Guatemala. 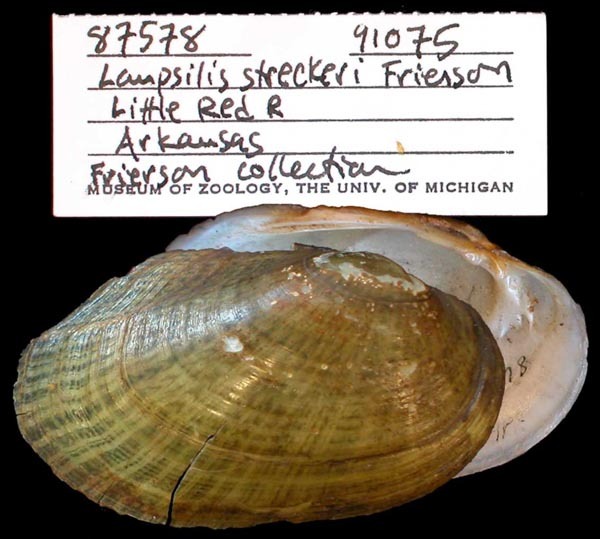 Lampsilis (Ligumia) streckeri Frierson, 1927. Frierson, 1927, Check List N. Amer. Naiades: 74, sp. 321. Frierson, 1928, Nautilus: 139, pl. 2, fig. 1. Type(s): HOLOTYPE UMMZ_91075, Little Red R., Arkansas. 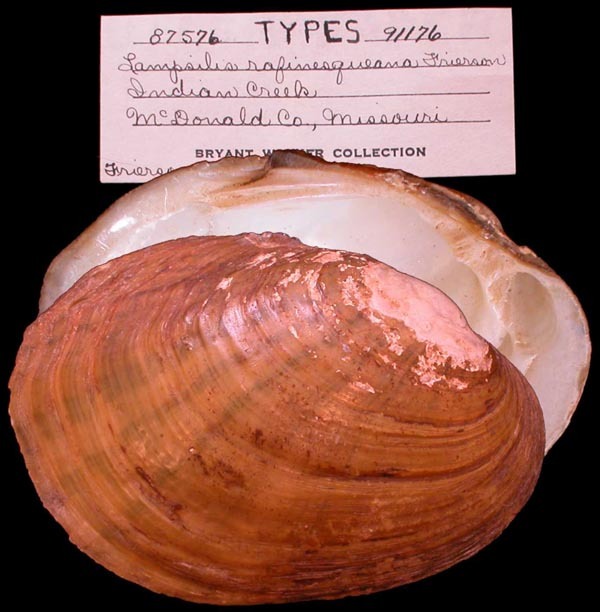 Lampsilis (s.s.) rafinesqueana Frierson, 1927. Frierson, 1927, Check List N. Amer. Naiades: 69, sp. 309. Frierson, 1928, Nautilus: 138, pl. 1, figs. 1-2. Type(s): SYNTYPES UMMZ_91176, Indian Creek, McDonald Co., McDonald. 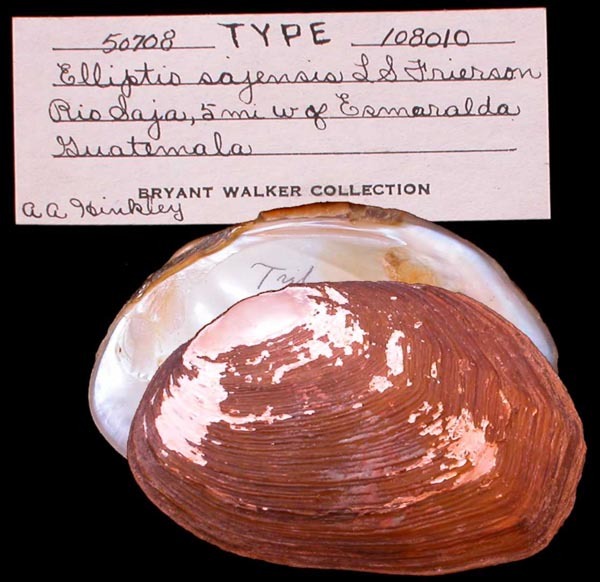 Lampsilis (Villosa) wrightiana Frierson, 1927. Frierson, 1927, Check List N. Amer. Naiades: 81, sp. 351. Frierson, 1928, Nautilus: 139, pl. 2, fig. 3. 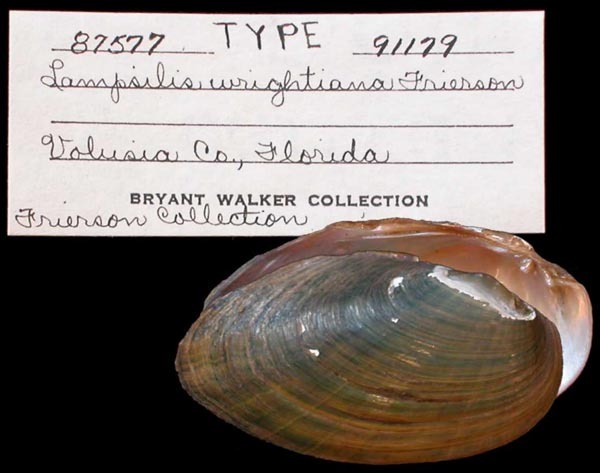 Type(s): SYNTYPE UMMZ_91179, Volusia Co., Fla.
Pleurobema (s.s.) aldrichi Frierson, 1927. Frierson, 1927, Check List N. Amer. Naiades: 44, sp. 197. Frierson, 1928, Nautilus: 139, pl. 3, fig. 1. 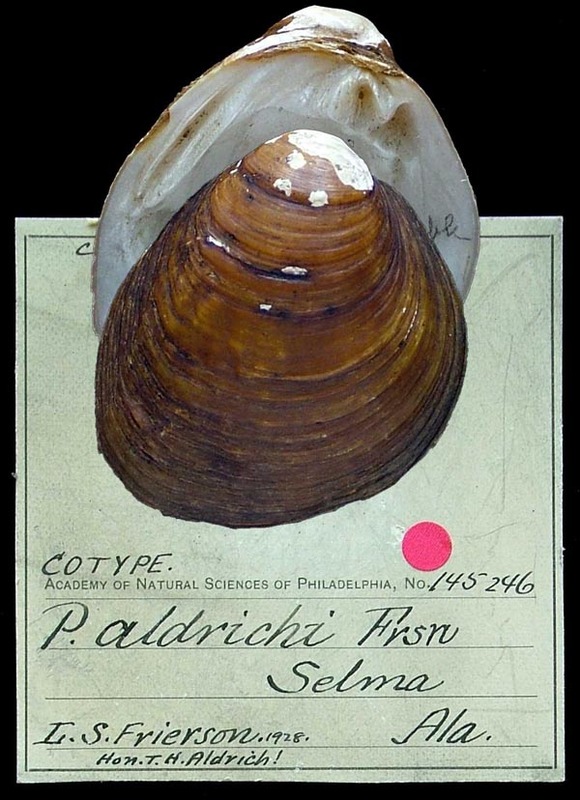 Type(s): LECTOTYPE ANSP_145246, Selma, Ala.
Pleurobema (s.s.) marshalli Frierson, 1927. Frierson, 1927, Check List N. Amer. Naiades: 43, sp. 196. Frierson, 1928, Nautilus: 139, pl. 3, fig. 3. 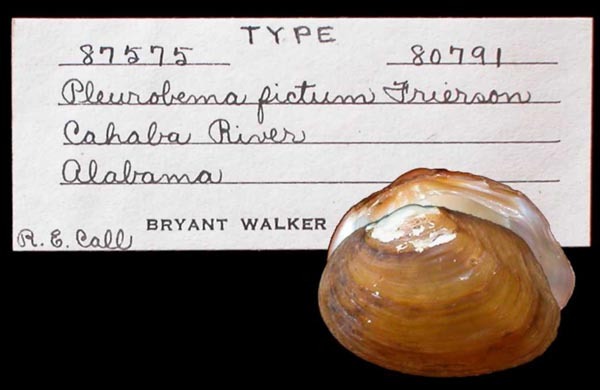 Type(s): FIGURED SYNTYPE UMMZ_80859, Tombigbee River, Boligee, Greene Co., Alabama.